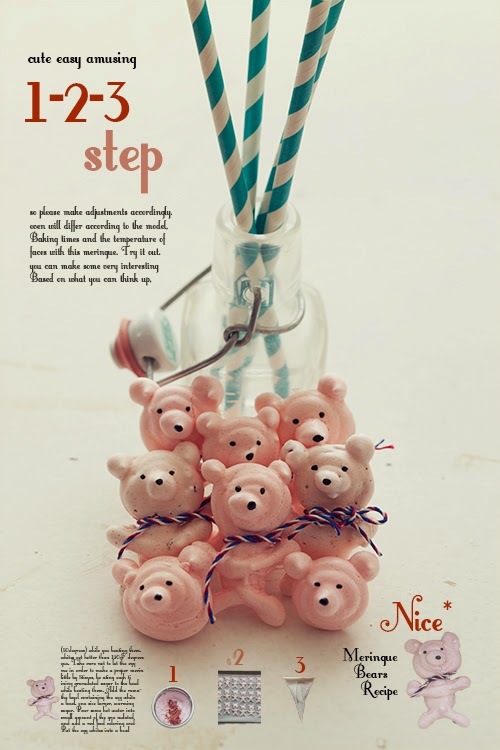 Changing the positions of the eyes and noses gives the bears different expressions, so these muffins are really fun! Please do try making them. The measuring cups used are all the type that is used in the US. First, make the crumble for the topping. 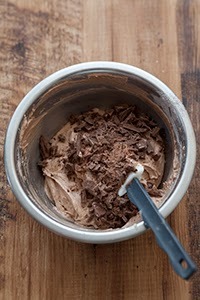 Put the cocoa powder and flour into the bowl, and mix them together. 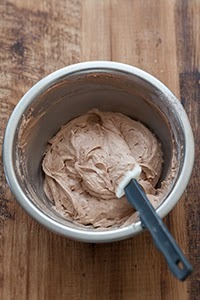 Break up the butter with the tips of your fingers, coating it with the cocoa and flour mixture as you do so. Continue to break up the butter further, until it forms rough clumps. Put it into the refrigerator to chill until use. Preheat the oven to 360° degrees Fahrenheit (180℃). 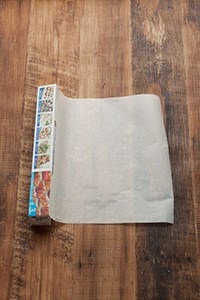 Lay some baking paper onto an oven plate. 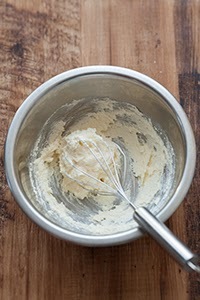 Beat the butter with a whisk until it is creamy. 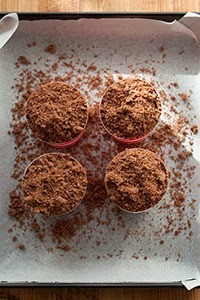 Divide the granulated sugar into five or six portions and add to the mixture one at a time, beating well as you go. Add the egg in eight stages, beating well after each addition. Take care not to add the egg all at once, as it will separate. Add the milk a little at a time, mixing well. 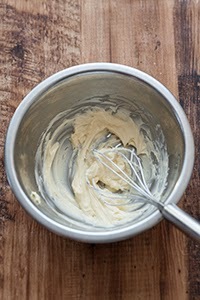 Exchange the whisk for a spatula. 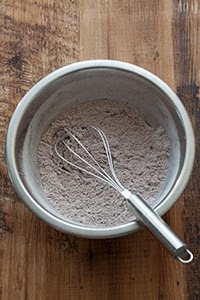 Add the baking powder, cocoa powder and flour, and mix well. Finally, add the chocolate and mix together briefly. 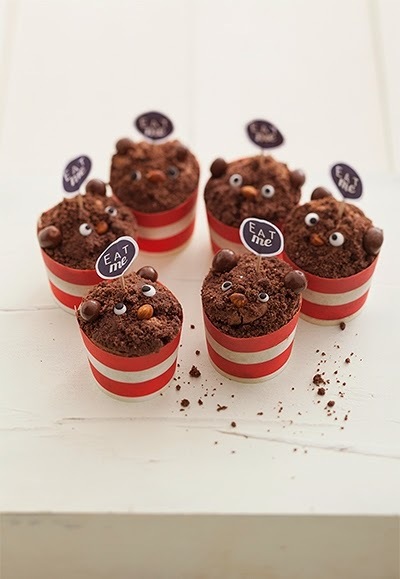 ☆This photograph only shows four muffins, but the recipe makes six. 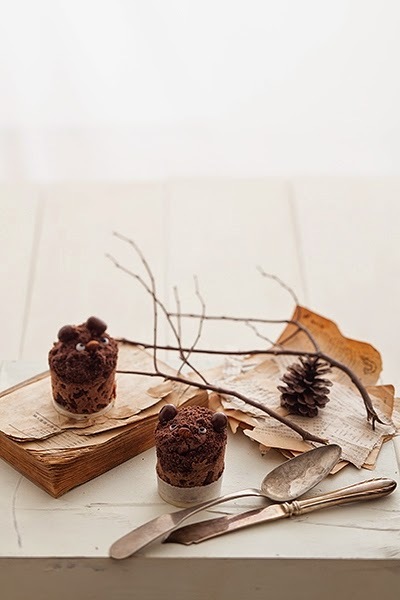 Take the chilled topping mixture out of the refrigerator and sprinkle it on top of the muffin dough.Preheat the oven to 360° degrees Fahrenheit (180℃). When a skewer inserted into the center of the muffins comes out clean, they are done! If the dough is not cooked right through, bake them for a little longer. Cool the muffins thoroughly before making the faces. 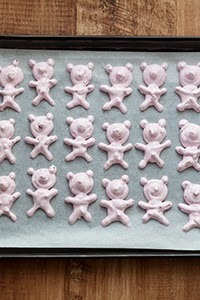 Use edible eyes for the eyes, roast almonds for the noses, and chocolate for the ears to make the bears' faces. Baking times and the temperature of the oven will differ according to the model, so please make adjustments accordingly. First, make the squeeze bags. 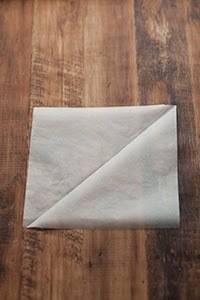 Cut a piece of baking parchment about 12 inches(30cm)long. Fold diagonally as seen in the photograph. 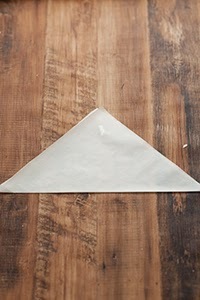 Lay the baking parchment as shown. 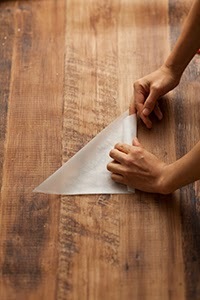 Roll the parchment from the edge as in the photograph. 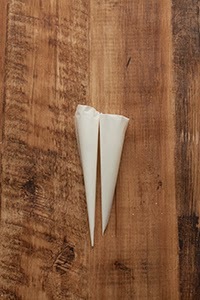 Roll so that the end is pointed, adjusting as necessary. Fold and tuck the last bit inside. The first squeeze bag is then done. 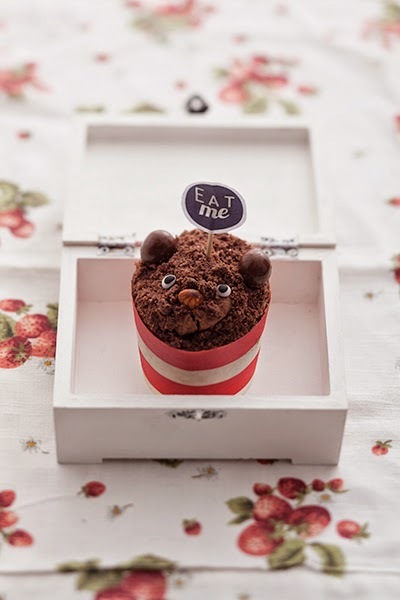 Now, make the Edible Eyes mixture. Put egg whites into a bowl. 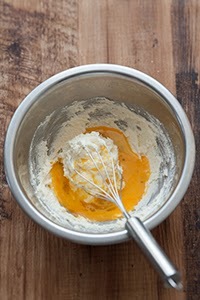 Add powdered sugar (5x the weight of the egg whites) and mix. 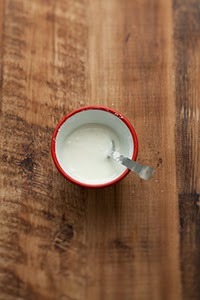 Put 1/5 of the egg white mixture into a separate bowl. 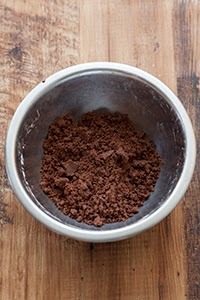 Add black cocoa powder and mix. Put each mixture into a separate squeeze bag. 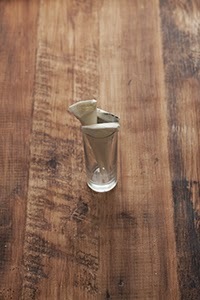 Setting the squeeze bag in a narrow glass can make it easier to pour in the mixture. Fold the edge of each bag over when done. 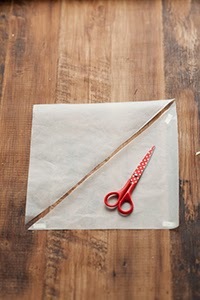 Cut the point of the squeeze bag with a scissors. 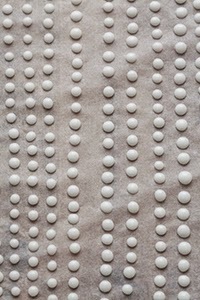 Squeeze small amounts of the white mixture on to baking parchment. Set aside for about 10 minutes so that the surface is somewhat dry. 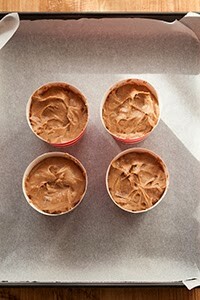 Squeeze small amounts of the dark mixture on top of the white mixture. When you are all done, set the eyes aside for 24 hours to dry. 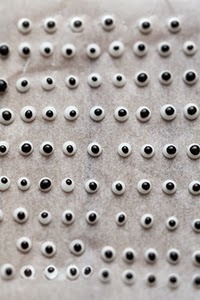 After they have dried, use the edible eyes as you like to add eyes to sweets, bread, fruit, and so on. These are fun because each pupil is unique and let you make lots of different expressions. 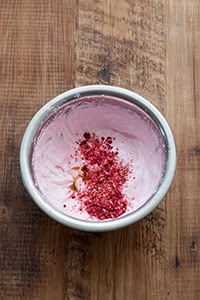 Put the egg whites into a bowl and add a little red food coloring and a small amount of the granulated sugar. 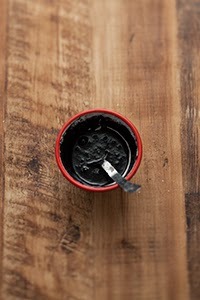 Pour some hot water into a bowl one size larger, warming the bowl containing the egg whites while beating them. Add the remaining granulated sugar to the bowl little by little 5 times, beating each time in order to make a proper meringue. Take care not to let the egg whites get hotter than 120F degrees (50℃ degrees Fahrenheit.) while you are beating them. 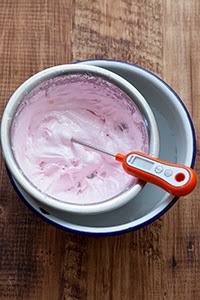 When the meringue reaches the consistency of slowly drooping down when the bowl is turned sideways, beating is complete. Add the vanilla essence, the strawberry flakes, and the raspberry flakes and lightly mix them with a spatula. Take care not to flatten the bubbles. 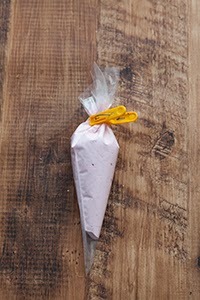 Put the meringue into a pastry bag. Preheat the oven to 230F degrees (110℃ degrees Fahrenheit.). 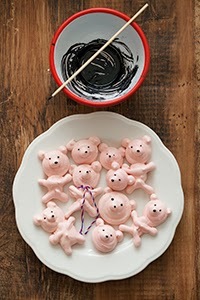 to making a bear-like meringue. Bake for 60 minutes. 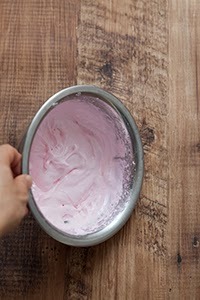 Leave the meringues in the oven to dry for at least 2 hours after they have finished baking. 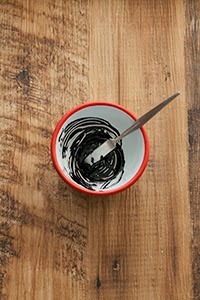 Make the icing by putting the egg white, powdered sugar, and black cocoa powder into a small bowl and mixing them together. 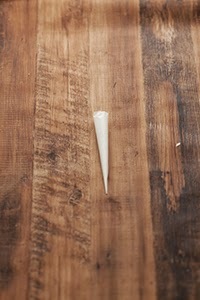 The meringues are complete when the icing has completely dried. aking times and the temperature of the oven will differ according to the model, so please make adjustments accordingly.